We have had one of those days today where we seem to have done a lot of learning without even thinking about it. It started at breakfast this morning. Jasmine sat down at the table, got her cereal (multigrain boulders) and said “What is 2 plus 3?” So I said she should count it out using her boulders! (She doesn’t have any milk on cereal luckily!) Thomas, of course, wanted to join in so we did some cereal addition as we started the day! After breakfast I took Jasmine to gymnastics (plenty of social and physical learning opportunities every week) and Gordon stayed at home with the boys. While I was out Thomas read a book to Ben (literacy) and they chose to play some board games (social, turn-taking, numeracy). They were still playing when Jasmine and I got back so Jasmine joined in and they chose a couple more to play together. 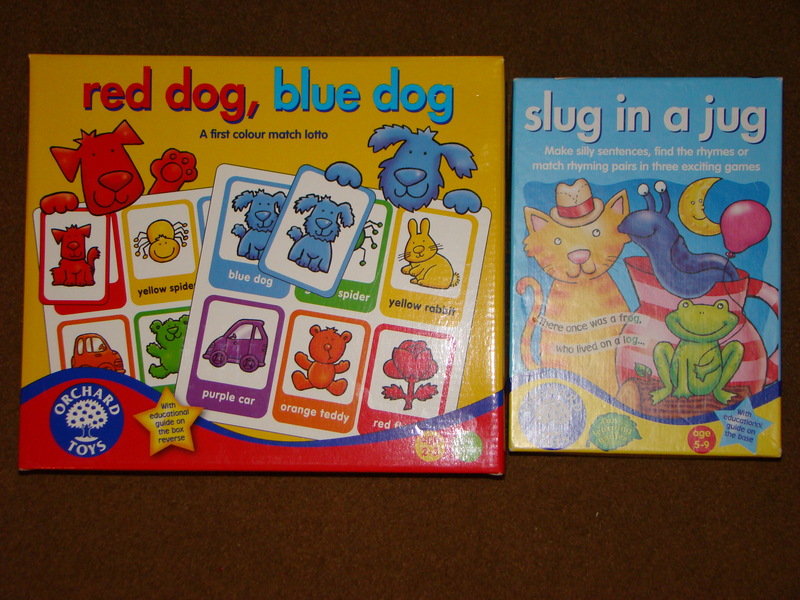 Thomas and Jasmine played Yo Ho Ho, a pirate matching pairs game from Orchard Toys, while I played Red Dog, Blue Dog with Ben (another from Orchard Toys) and finally we played Slug in a Jug, another matching pairs game but this time with rhyming words. In all that I reckon we got literacy, numeracy, social and turn-taking, and colours for Ben! By then it was lunch time but while I was preparing the food the kids were busy with jigsaws and completed some dinosaur ones and a giant alphabet one. After lunch Jasmine asked to go on Reading Eggs, so more literacy for her. The boys went off to play with Lego and Jasmine followed after her computer session. I think the learning opportunities with Lego are endless and they spent most of the afternoon designing and building models, mostly cars and spaceships and mostly based around Star Wars! After dinner they asked to watch Deadly 60 (a CBBC wildlife documentary programme) on DVD so we watched one episode and got some science and nature into the day! While the DVD was on Jasmine got a pencil and paper and started making “a book” with a few words and pictures in. I’m not really sure what it is about but she started of writing “cat” and told me she was going to write “cats have stuff”, but the next time I looked over she told me it was a volcano and lots of water to put the fire out! She has left it out and instructed me not to touch it so she can finish it tomorrow so maybe I’ll find out more then! Finally, the kids bed time story at the moment is a book from the Astrosaurs series, The Skies of Fears so we fitted in a little more literacy just before bed!